Lucille: What will happen if they catch you? They'll shoot you won't they? Harry: First, they'll have to catch me. Over the weekend, I had a sobering cinematic revelation: Humphrey Bogart, the first movie actor I looked up to as a kid through Sunday night screenings of his classic films on Atlanta's WTCG (future cable superstation TBS) was human after all. Yes, the man who was nothing short of a god in my eyes (Casablanca, High Sierra, The Maltese Falcon, The Caine Mutiny, The Harder They Fall, The African Queen and a half-dozen other personal favorites) was actually capable of appearing in a jaw-droppingly bad piece of celluloid. Guffaw and chuckle all you want, but this hit me where I live. Okay, so I'm going a little melodramatic like an over-the-top First National Pictures B-movie actor. Truthfully, I know that Bogey had his share of clunkers in his early days at Warner Bros as a contract player. Still, some of those projects were interesting curiosities that found the future legend tackling many an odd job ranging from wrestling promoter (Swing Your Lady) to fisherman with bad Errol Flynn-type mustache (Isle of Fury) to mad scientist (I kid you not) brought back from the dead complete with laughingly tacky make-up in The Return of Dr. X. Roles like those became laughable memories once Bogart established himself as an A-list performer in the 1940s with remarkable consistency when it came to landing one great part after another. But like the rest of us, Humphrey had a bad day at the office every once in a while. Sirocco, a 1951 effort produced under the actor's own Santana production banner unfortunately falls into that category. Leaden and uninspired, this effort sends Bogey back in time to 1920s Syria, where life was anything but roaring for the locals under French control. Posing as a food merchant while playing gunrunner in Damascus, Harry Smith (Bogart) crosses paths with military intelligence Colonel Feroud (Lee J. Cobb), who wants to end the conflict in a peaceful manner. Complications arise when the colonel's beguiling mistress Lucille (Märta Torén) becomes attracted to Harry, who finds his uncomfortable position agitated even further when the resistance takes Feroud prisoner. Should the world-weary American take advantage of the situation and flee with his Swedish tart or rescue his rival? 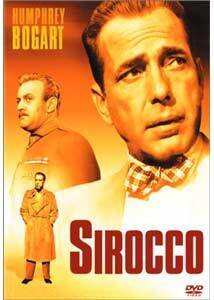 If memories of a beloved 1942 dramatic romance film are coming to mind, it's not conincidental... the makers of Sirocco desperately wanted to invoke the magic of Casablanca. While that film had the advantages of great plotting, writing, editing and casting, all of those qualities are dreadfully lacking here. But the biggest sin of Sirocco? It's just not very interesting. Snails on morphine move faster than the pace of this movie and wooden direction by Curtis Bernhardt doesn't help. Torén is beautiful and a welcome distraction, but after a promising setup as the woman caught in the middle, her part goes nowhere. Cobb is horribly miscast in his military role and looks about as comfortable as John Wayne did as Genghis Khan. And poor old Bogey... like "John at the bar" in Billy Joel's musical chestnut Piano Man, I know there's some place he would have rather been. Aside from a couple of moments at the halfway point invested with his trademark passion, this is about as flat a role the man was ever saddled with. Image Transfer Review: Other than some frame damage in the opening reel of the film and occasional speckling, visual quality is fine. Not exactly overwhelming or as pristine as other black & white films I've viewed from this period, but the monochrome image is consistent and good sharpness levels help. Audio Transfer Review: Slightly inconsistent with dialogue in some scenes affected by distortion, but not in an annoying way. Practically no lower frequencies, but the film is so devoid of action and muscial scoring, so this is not much of an issue. Negatives aside, an acceptable audio transfer, minus all the crackling of revival house/television prints of old. Extras Review: Like all titles in Columbia's releases of Bogart films in their archives thus far, bonuses are light: trailers for The Bridge on the River Kwai, The Caine Mutiny (a much, much better Bogart film I recommend without hesitation) and Lawrence of Arabia; a vintage advertising section (that only consists of two lobby cards) and the same 4-minute montage of Bogart collectibles that also appeared on the recent DVD releases of Dead Reckoning and The Harder They Fall. To paraphrase one of my favorite Bogart lines: Of all the DVD players in all the world, Sirocco ends up in mine. Unless you want to play completist or are merely curious, I would invest in Columbia's other Bogey titles like Dead Reckoning or In a Lonely Place instead.